Every year RIT holds a great event called Imagine RIT where students display creative and innovative projects from all different disciplines. This year it was even more fun for my daughter & I to attend over the past weekend as one of the displays was done by a group of students that I’d been both helping and learning from. A small team of engineering students have been working on a project for Haiti focusing on designing a tropical port-a-potty made from locally available materials. The idea is that these movable latrines are in one location for a certain period of time and once moved, trees can be planted in the former ‘hot spot’ to take advantage of the nutrients left behind, a sort of modern day version of night soil. Lots more info on their project here. Cement doesn’t really qualify as a local material in Haiti so the idea was to minimize the amount of cement in the recipe without sacrificing strength and other properties. Various recipes using different materials were tested from Styrofoam peanuts, to coconut residues (coir & shells), to biochar. Chunks of coconut shells (which were diligently hammered for hours by students) were tried and three different types of biochar were tested as well. 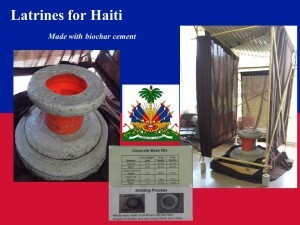 In the end they chose biochar made from cherry pits as it is more likely that biochar would be made from agricultural residues versus wood, which is in scarce supply in Haiti. The final recipe used in the prototype included 7.7% biochar by volume. While by weight the amount of char was only 2.2% of the recipe, it had a very positive impact on making the cement pieces lighter while still maintaining strength. The biochar cement mix was poured into handmade molds which were created by laboriously cutting countless layers of cardboard into just the right shape and then basically taping over the cutaway bits.